Having only taken a Train ride through Cuyahoga National Park a few years ago I have been wanting to get back there and photograph the waterfalls. 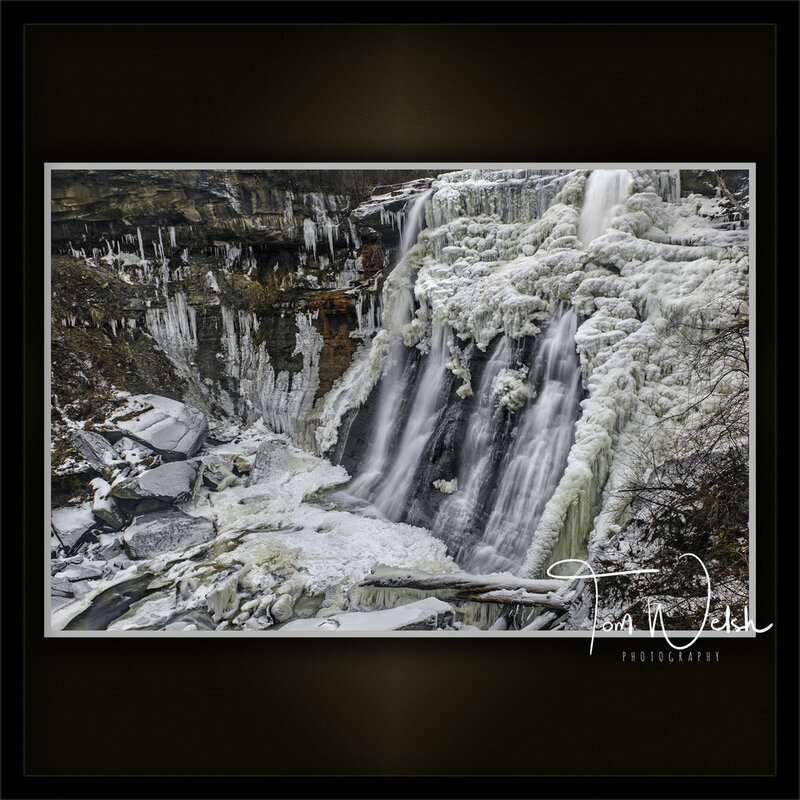 Last week, seeing snow in the forecast I decided to pack up the camera equipment and head for Brandywine Falls hoping to capture a great Winter Scene. Having never been there I wasn't very sure what to expect. As the temperatures were in the 30s my minds eye saw rushing waters and snow covered rocks and trees. I woke up early and left Westerville before sunrise. The snow in the forecast was not quite what I expected, it was very intermittent and more wet than snow. Once I got there I found the falls to be more frozen than not but impressive none the less! What I had envisioned the night before just wasn't meant to be so I changed my focus to what was in front of me. I read once that "Art is not what you see but what you make others see" by Edgar Degas...I decided to look for art.....What can I capture that most might not see but what I wanted them to see! 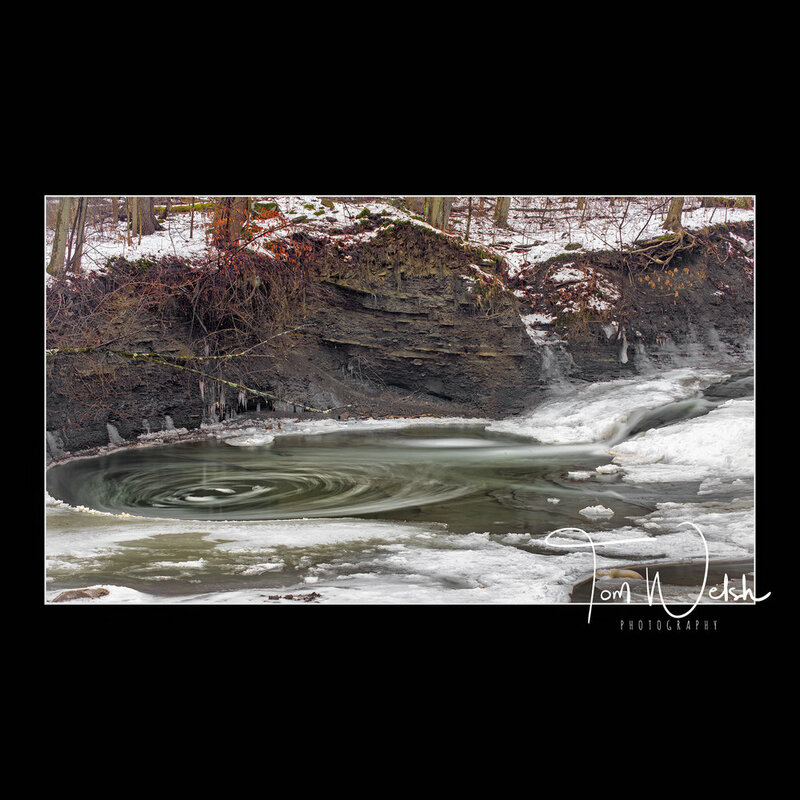 Looking to capture the roughness and texture of the frozen falls juxtaposed against the softness of the waters flowing over the rocks I set up up my camera and tripod and began looking for images that were now in my minds eye! Carved by Brandywine Creek, the 65-foot falls demonstrates classic geological features of waterfalls. A layer of hard rock caps the waterfall, protecting softer layers of rock below. In this case, the top layer is Berea Sandstone. The softer layers include Bedford and Cleveland shales, soft rocks formed from mud found on the sea floor that covered this area 350-400 million years ago. Shale is thinly chunked, giving water a bridal veil appearance as it cascades down the falls. A combination of boardwalk and steps brings you into the waterfall's gorge and lets you view the waterfall head-on (a boardwalk option without stairs is also available). The boardwalk also provides a close look at Berea Sandstone. Careful inspection will reveal the individual grains of sand that accumulated in a sea 320 million years ago. Berea Sandstone is high quality sandstone found commonly throughout this area, both in nature and as a construction material used in buildings and canal locks. Early settlers in the valley saw the falls, not just as an object of beauty, but as something to be used for its water power. In 1814, George Wallace built a saw mill at the top of the falls. Grist and woolen mills followed. The Village of Brandywine grew around the mills and became one of the earliest communities to emerge in the Cuyahoga Valley. Much of the village is now mostly gone, lost to the construction of nearby Interstate 271. However, the James Wallace house, built by George's son, remains and is a bed & breakfast, the Inn at Brandywine Falls.